This stone mill was built in 1801 with bricks of the destroyed castle Wintershove. As the outer walls were coated with whitewash, the name ‘the white mill’ was obvious. Beside grain, the millstones also ground flaxen seed and cole-seed in order to produce oil. Round about 1870, the wings disappeared and from then on, a steam engine took care of the drive. During the First World War, english ambulances brought wounded soldiers to the field hospital that was organised in the ‘body’ of the mill. In 1966, they pulled down the dilapidated mill, as well as the chimney of the steam engine. The hopwarehouse was built in 1868. At the turn of the 20th century, in that warehouse, the owners, who bought the hop from local farmers, dryed, sulphated and compressed the hop into bales. The export of hop to England was enormous. 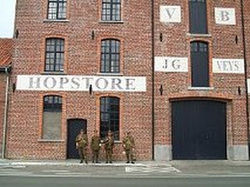 During the first World War, the warehouse was used to house wounded soldiers.